Three musical compositions. Thirteen performers. Six dances. Each a world of its own. Marie-Josée Chartier creates unique choreographic worlds that shape and reshape our perception of sound. 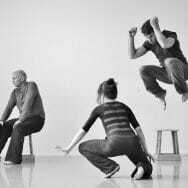 The music is imagined through moving bodies – twice, resulting into two distinct choreographies that invite us to witness how movement allows us to see the beauty and the complexity of each musical composition. With an exceptional ensemble of professional dancers, as well as local performers, Chartier imagines and reimagines each instrumental score by creating a visual and physical landscape. petites danses is a collection of small dances with vast imagination. Set to the music of Linda C. Smith, Rodney Sharman, James Tenny, and Nick Storring. Made Possible With Support from the Ontario Arts Council – Ontario Dances program.